the Squirrel, a human being, possibly the chief of the household in whose memory it was erected, Tewalasa, holding the Marten in his hands. 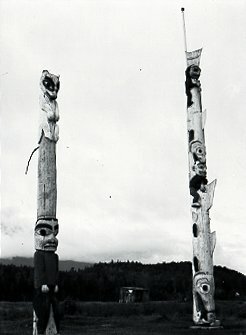 (LOOK AT PLATE XXIX figure 2, Barbeau, Totem Poles of the Gitksan - note in pencil "only this much restored" - It would appear that the pole was not restored correctly? (see PN 8371 ,also fig.2,) WHERE IS THE MARTEN? For full description of entire pole see p.138, Barbeau, Totem Poles of The Gitksan.